Sometimes life is a sprint and sometimes it's a slog, but Father' Day gives us an opportunity to encourage men to press on and become all they can be in Jesus. Celebrations are part of Father's Day, but we miss out on the opportunity to challenge dads, we miss out on an opportunity to give them the most valuable gift we can—the challenge to become a better man. To help you do that, below are some resources to help you do that. You could use these on announcement slides or your bulletin. All of them present a challenge for men to be all they can be in Jesus. "Train up a child in the way he should go – but be sure you go that way yourself." "A man ought to live so that everybody knows he is a Christian … and most of all, his family ought to know." All of us, men and women know we aren't all we want to be in our Christian lives. 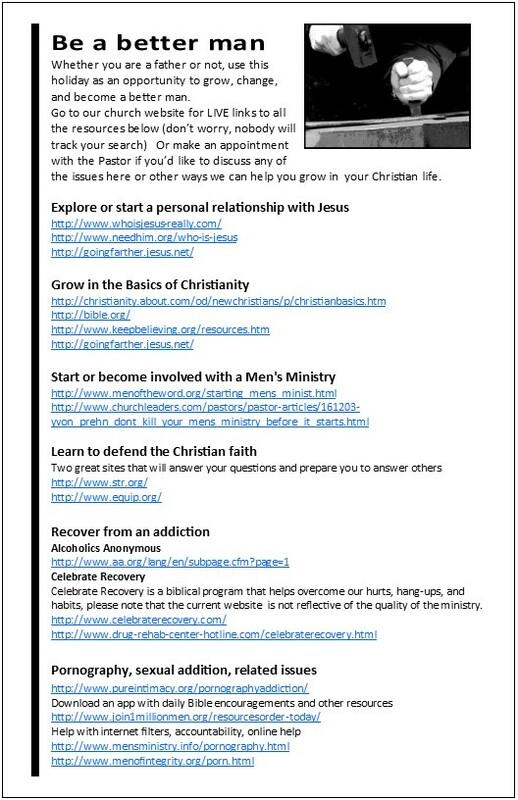 To help us along below are some bulletin inserts or flyers that link to a variety of resources to help men grow in their spiritual lives. 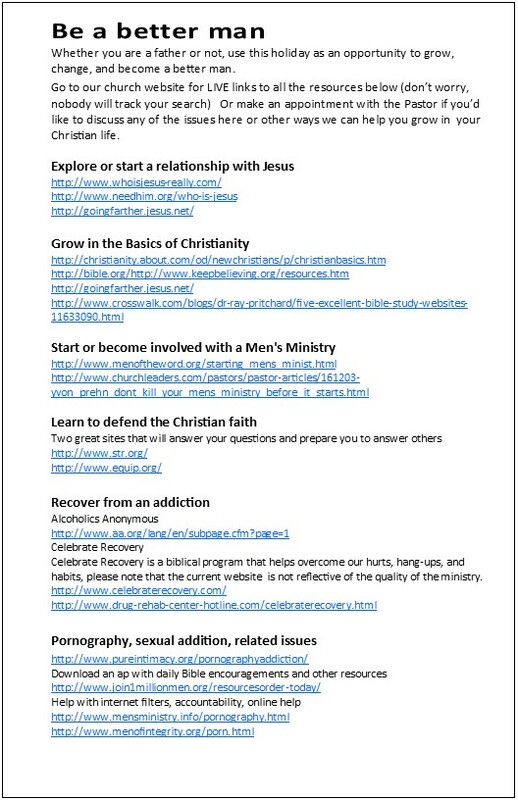 These handouts might not be a cuddly, upbeat way to celebrate Father's Day, but they might have an eternal impact that is far more important on the men of your church and their families. 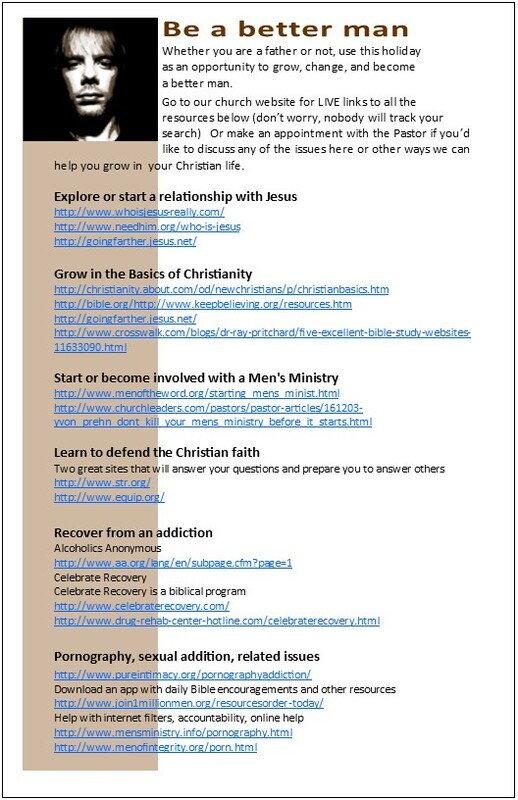 Add additional resources, groups, pastoral helps your church might have in these areas also. 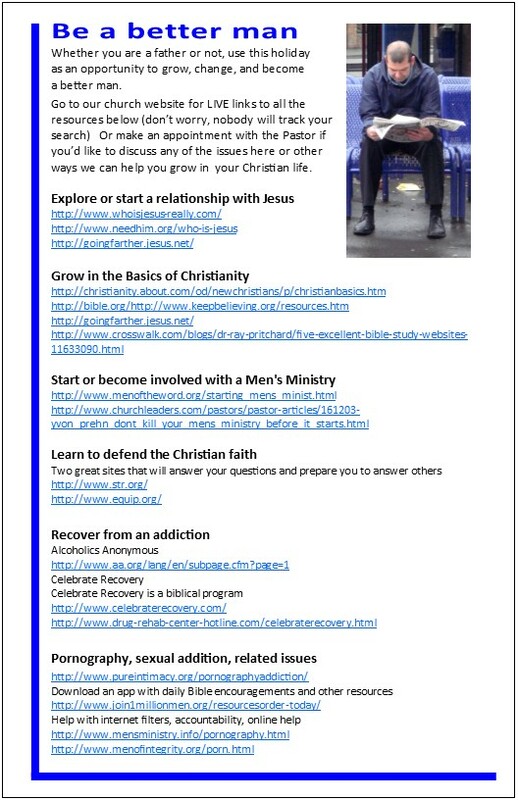 You might also use the back of the flyer to promote your men's ministry. These are FREE for everyone. Please use and pass on. Most of all PRAY God will use the resources here to grow godly men who will be a joy to their families, their church, and Jesus.